Perhaps the simplest and most common Sudoku variation is the one often known as "Sudoku X" or "Sudoku Extreme". 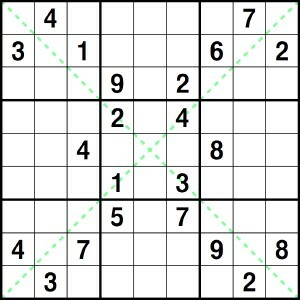 In this variation, the usual rules of Sudoku apply, but in addition, the cells that make up the main diagonals must also contain the numbers 1--9 exactly once. 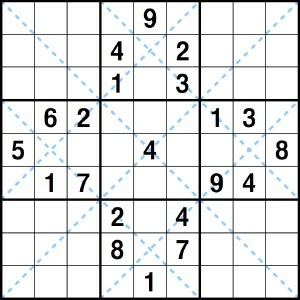 This example of Sudoku X has difficulty level 2 out of 3. Tip: All your usual Sudoku strategies will still apply here. When those strategies aren't enough to get you unstuck, start to consider what numbers can -- or can't -- go in the cells of the diagonal regions. Now things get a little more interesting with six diagonal regions added to the usual rules of Sudoku. The two main diagonals are "full" Sudoku regions in the sense that the numbers 1--9 each each appear exactly once, with no repeats. The remaining four shorter diagonals are "partial" Sudoku regions -- they won't contain all of the numbers 1--9, but no number will be repeated. This is an original Brainfreeze variation. This example of Bold X has difficulty level 1 out of 3. Tip: The shorter diagonals each have exactly eight cells, so will contain exactly eight of the nine numbers 1--9. If you can figure out which number must be the one that is missing in one of these diagonals, then you can use the fact that the remaining eight numbers must each appear there. Also notice that the center 3x3 block has a lot of constraints on it from the diagonals. In these puzzles the usual rules of Sudoku apply, and in addition the main diagonals must contain each of the numbers 1--9 exactly once and the four shorter diagonals cannot contain any repeated entries. This is an original Brainfreeze variation. This example of Snowflake has difficulty level 2 out of 3. Tip: The shorter diagonals can be difficult to use because they each only contain six of the numbers 1--9. But don't forget about them! They can be quite useful for eliminating possibilities in the four blocks above, below, left, and right of the center block, especially in the cells where two diagonals intersect. These puzzles are similar to "Snowflake" puzzles but with a different design. 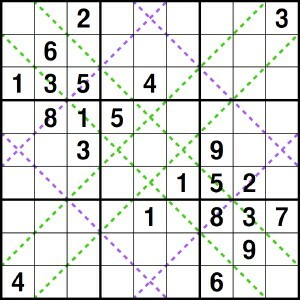 Notice that none of the eight marked diagonals are full Sudoku regions. 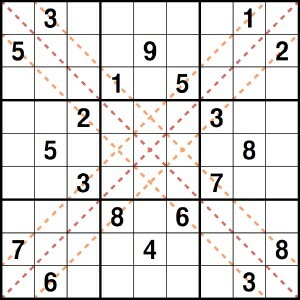 The usual rules of Sudoku apply, and in addition there are no repeated entries in any marked diagonal. This is an original Brainfreeze variation. This example of Argyle has difficulty level 3 out of 3. Tip: The longest marked diagonals have eight cells, so as in "Bold X", try to figure out which number must be missing from each of these diagonals. As with "Snowflake", pay close attention to the cells where two diagonals intersect.